This could have been you on October 7, 2015. Looks like we missed Armageddon. Again. The world did not end in conflagration, though thousands of people insisted it would. Doomsday 2015 was scheduled for yesterday, October 7, but we seem to still be alive. If you missed the news stories, here are some links: “Christian group predicts the world will be ‘annihilated’ on Wednesday”; “Christian group awaits fiery Wednesday apocalypse”; and “Don’t make any plans for Thursday: Christian doomsday group predicts world will be ‘destroyed by fire’ tomorrow”. This is the eighth or ninth serious rapturous prediction in my own lifetime. I’m getting used to it. And that should worry the folks who keep repeating these mistakes. Sure, the first couple of times I ran and hid like a child. (I was 8 years old.) But after the fourth, I stayed at work (though I fueled up my truck and packed a lunch and dinner, just in case). By the seventh call to repent and fly up into heaven, I sort of ignored the event altogether. Back in May of 2011, when the California preacher Harold Camping predicted the end (twice in one year! ), I was becoming annoyed. A few months later the old preacher gassed out and it was disclosed that he had sucked millions from his followers and was worth $72 million upon death. I wasn’t annoyed, I was mad. Some very decent (albeit very naive) folks had been robbed. A 97-year-old Saskatchewan cowboy who believed. My Saskatchewan cowboy buddy was typical of the folks who become convinced that Armageddon is nigh. They tend to be smart, generous, and upon failure, quite accepting of their missed one-way flights. But they usually don’t quit believing that the Second Coming of Jesus Christ will happen before they die. Often, when faced with rather clear signs that the world hasn’t conflagrated, the hopeful re-interpret the divine message. 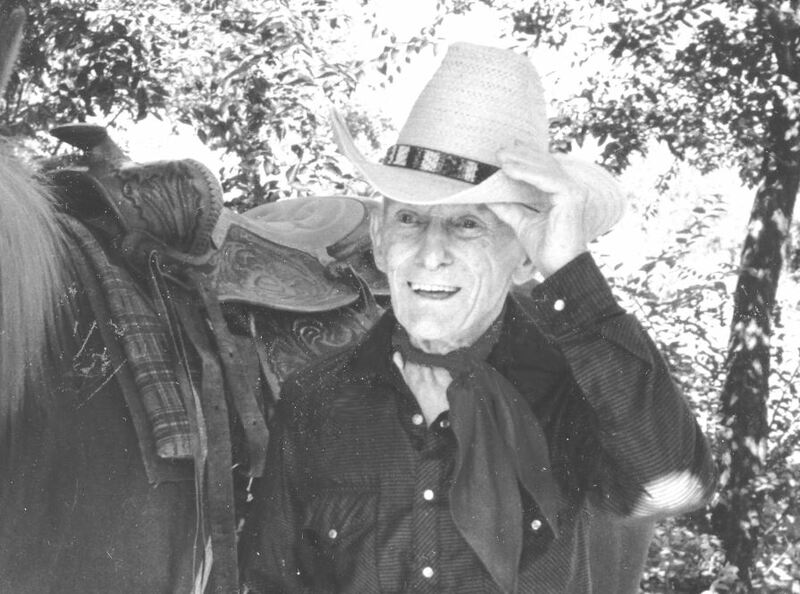 The cowboy did that, telling me that the real rapture was that God had entered his heart on that day. 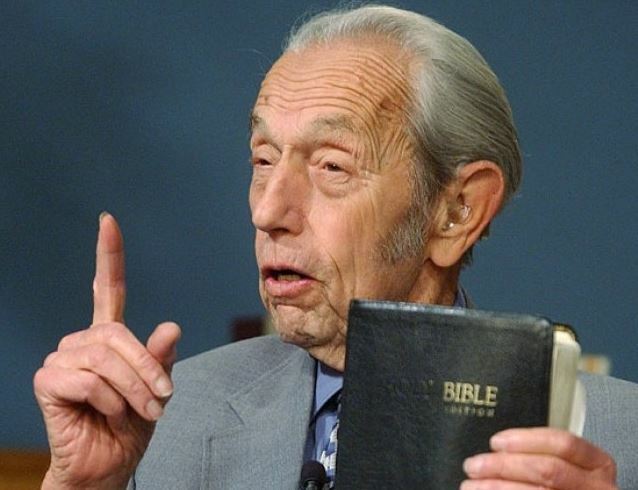 The multi-millionaire preacher (Harold Camping) told the world that the May 2011 apocalypse was postponed until October 2011 to give people more time. (For what? To send him more money?) When the October event failed, Camping, age 92, died. When the Jehovah’s Witnesses’ prophet messed up his 1914 Doomsday forecast, Charles Russell simply said that Jesus had indeed returned, was floating in the clouds, giving the Witnesses a little more time to knock on their neighbours’ doors. So far, it’s been over a century, and the church has grown to over 8 million. In the cases of Camping and the Witnesses, anyone who believes in an acceptable way will be saved from the ugliness that God will bring. There’s not much hope for the rest of us. Lack of evidence doesn’t matter. In yesterday’s failed prediction, the October moon was supposed to bring an unexpected apocalyptic meteor shower. But there was never any evidence that a swarm of asteroids was waiting to pelt us as our planet came around its final bend. Three or four blood-red full moons in one year don’t necessarily mean the planet would ignite. Scientific evidence can’t change hearts that are married to dogmatic belief. Nor can an honest examination of history. One would hope that people would realize that The End has been falsely predicted over and over again. Previous false prophesies should make the gullible wary. A friend from my childhood belongs to one of the prophesy churches. I asked him about the many fails. He simply said, “They were wrong in the past, of course. But we’ve got it right.” This time, it’s different. I guess that every generation assumes it’s getting doomsday prophesy right while all the earlier ones were wrong. As Chris McCann, the leader and founder of this latest fiasco of failed Christian prophesy said back in 2013, “What risk is there when God is telling us what’s going to happen? Zero.” Well, sure, if it’s really God speaking. If not, some people may become financially bankrupted, lose jobs, or at least feel sheepishly foolish. When asked what the Earth’s status will be after Doomsday October 7, 2015, McCann said with apparent certainty, “It’ll be gone forever. Annihilated.” Hmmm. Chris, today is October 8. The sun came up this morning. Around the year 30: Regarding events leading up to Judgement Day, Jesus says (Matthew 24:34) “This generation shall not pass, till all these things be fulfilled.” But that generation did pass. Revision and apologetics came quickly. The year 150: The powerful charismatic Montanists prophesized that Jesus would return sometime during their lifetime. They expected he would build New Jerusalem in the city of Pepuza in Asia Minor. 235: The Antipope (and later Catholic Saint) Hippolytus, predicted an imminent Armageddon. Hippolytus was quite popular. He is known as an Antipope because he claimed the title of pope and said that the man on Peter’s Rock was actually the Antichrist. Somehow his disrespect towards the church was forgiven because Hippolytus was canonized by the same church he had rejected. By the way, his beef with Pope Zephyrinus was that Zephy believed Father and Son are two names for the same entity, an idea which Hippolytus found blasphemous. So Hippolytus knew Zephyrinus was an Antichrist. Hippolytus also attacked popes Callixtus, Urban, and Pontian, all of whom he saw as liberals and Antichrists who were setting the stage for Armageddon. Saint Hippolytus had tens of thousands of followers and the division threatened Rome’s dominance of the Church. 365: Bishop Hilarius of Poitiers, aka the Hammer of the Arians (The Arians were the nails, Hilarious was the hammer.) was a saint born into a family of “well off Pagans” in France where he received a good education, including the study of classical Greek. He distinguished himself by declaring that anyone who accepts Christ without acknowledging the Trinity Theory were Antichrists. His work was instrumental in moving that doctrine into the Church’s mainstream, where it resides today. He also announced that the world would end in a hundred years because of the politics of his heretical (but fellow Christian) political enemies, all of whom were Antichrists. 375 to 400: Hilary, or Saint Hilarious, died in 367. His disciple Saint Martin of Tours, re-interpreted Hilarious’s doctrine and discovered that the world would end before the year 400. There are many more Doomsday prophesies in this era, most associated with church schisms and power struggles. Let’s skip ahead. 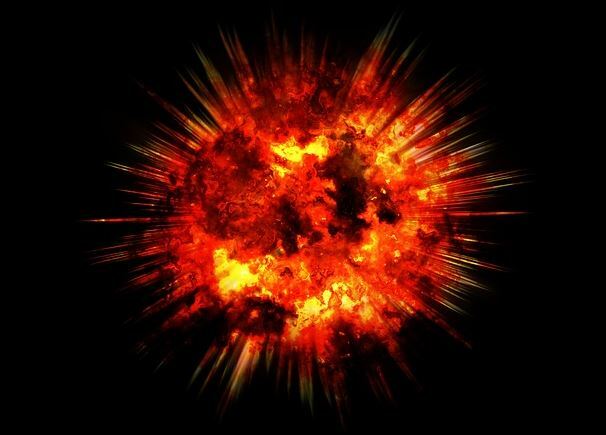 1000: With a thousand years passing since the first Christian Doomsday prediction, people in Europe were pretty sure the year 1000 would mark the world’s end because 1000 is neatly divisible by 1000. Christian armies attacked pagan countries in Northern Europe, hoping to either kill the miscreants or convert them before it was too late for their hapless northern neighbours’ salvation. In May of 1000, the tomb of Charlemagne (who had been dead for two hundred years) was supposedly opened by Otto III with the expectation that Charlemagne would rise, take sword, and fight the Antichrist. Or maybe not. Charlemagne was disturbed repeatedly after being placed in his tomb, mostly for political reasons and the historical equivalent of photo-ops. 1147: Gerard of Poehlde figured that Christ had already returned and had been ruling for centuries through his papal spokesmen in Rome. According to Gerard, it began with Constantine in 306. After a thousand years of good governance (of which Gerard was part) Satan would be released (in 1306) and Armageddon would begin. 1179: An Englishman, Cardinal John of Toledo, predicted the end of the world would come with a planetary alignment in conjunction with the constellation Libra during 1186. 1205: An Italian mystic and founder of a monastic order, Joachim of Fiore, predicted in 1190 that the Antichrist was already busy making mischief (he was believed to be King Frederick II of the Holy Roman Empire). Joachim figured that King Richard of England would defeat Frederick in battle at Armageddon (in 1205), and the Millennium would begin. 1284: Pope Innocent III calculated that Armageddon would be in 1284 because the year was 666 years onto the date the Islam was founded. Why 666 years? Why Islam? In the next few hundred years, there were crusades to the Middle East that were intended to hasten Armageddon; there was also the slaughter of Satan’s little helpers (kittens) because people thought cats and witches spread the black plague that leads directly to Doomsday. There were attempts to build New Jerusalem in Strasbourg in 1533, and in 1669, it is rumored that 20,000 members of The Old Believers faith in Russia burned themselves to death rather than face the Antichrist who they thought was already looking for them. In 1736, the very respectable William Whitson, who succeeded Newton as Lucasian Professor of Mathematics at Cambridge, calculated that a comet would collide with the Earth. As a theologian, he saw it as the doomsday of prophesy and good Englishmen rioted after the news. Later, the 1783 Icelandic volcano killed a quarter of that country’s people and darkened British skies, leading thousands to expect the Second Coming. And on it goes. Here is a PDF that lists some of the more spectacular fails. There are dozens of lists on the web, some full of inaccuracies, but you can sleuth through the links and let me know what you find. In our more recent era, Doomsday belief blossomed in America. The USA showed the world the way of tolerance and liberty. Religious freedom allowed a plethora of new faiths, many of which contained elements of the impending apocalypse. John Smith (the Mormon prophet) predicted it would all end before the 19th century ended. In 1830, Margaret McDonald had a prophesy that socialist Robert Owen was the one and only Antichrist. Owen founded New Harmony in Indiana and died in 1859 – without destroying the world. A former Baptist named William Miller predicted the end would start in 1843, then had to change the date to 1844. He was going to guess again, and pick 1845, but by then his thousands of American followers, mostly in New York and Pennsylvania, had lost interest. Or joined one of the many competing Doomsday prophets. In August, 1886, an unexpected Charleston, South Carolina, earthquake destroyed a quarter of all the buildings in the city and many assumed the destruction was the act of an angry God. Canadian Ezekiel Wiggins (the Ottawa Prophet) was told by an angel that a second, much more devastating, earthquake would strike the eastern seaboard one month later, on September 29. His prophecy created widespread panic. Believers quit their jobs and donned fashionable “ascension robes” in preparation for the Second Coming. Most were back at work the following Monday. All of this barely scratches the surface of the failed predictions. Yet many thousands continue to expect veracity in prophesy. All of this seems funny today, but in 2015, thousands thought the big red moon meant the same thing, didn’t they? As revealed in Joel 2:31, the end of days will be known by the arrival of a blood moon. “The sun shall be turned into darkness, and the moon into blood, before the great and the terrible day of the Lord comes,” reads the biblical passage. That’s what the Bible tells us. 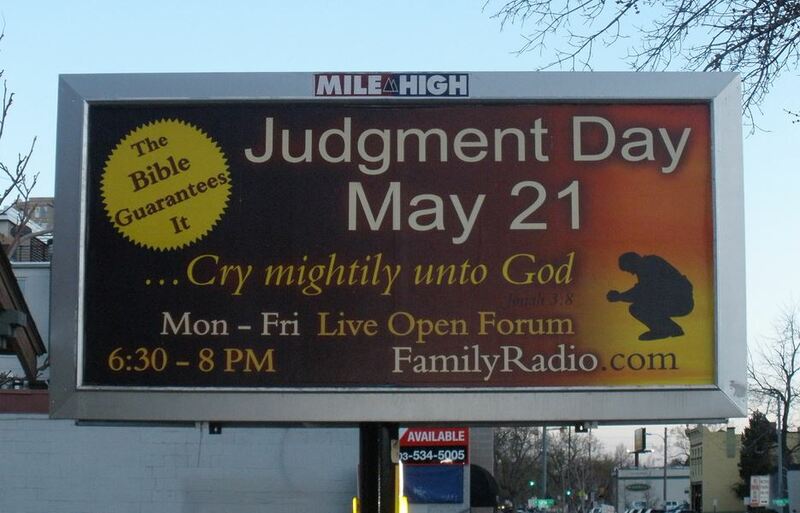 As the sign says, “The Bible Guarantees it.” So, is that a money-back guarantee? Followers of multi-millionaire Preacher Harold Camping know the answer. This entry was posted in Culture, History, Religion and tagged Armageddon, Doomsday, End of the World, Harold Camping. Bookmark the permalink.